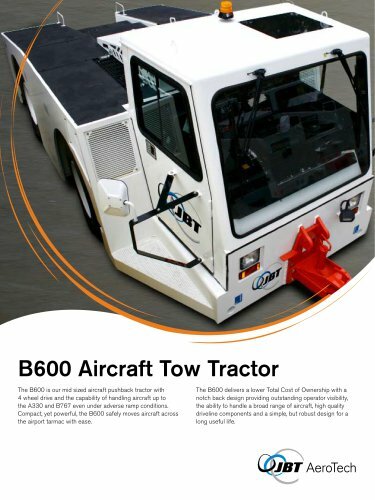 B600 Aircraft Tow Tractor The B600 is our mid sized aircraft pushback tractor with 4 wheel drive and the capability of handling aircraft up to the A330 and B767 even under adverse ramp conditions. Compact, yet powerful, the B600 safely moves aircraft across the airport tarmac with ease. The B600 delivers a lower Total Cost of Ownership with a notch back design providing outstanding operator visibility, the ability to handle a broad range of aircraft, high quality driveline components and a simple, but robust design for a long useful life.